The University of Maryland, Baltimore County (UMBC) celebrated Earth Week this year with a lecture and book signing by Rachel Carson Council President Bob Musil, the opening of its new, state-of-the-art Lenehan Arts and Humanities Center, and by joining the Rachel Carson Council network of campuses. 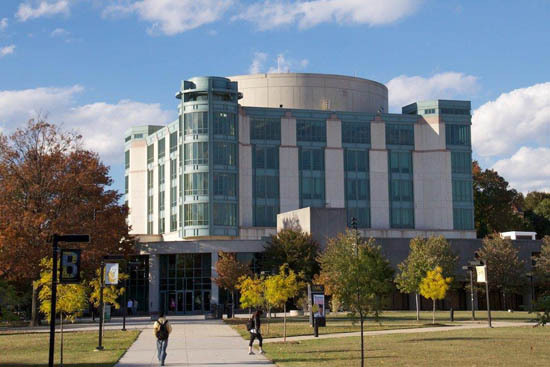 An honors university noted, under the leadership of President Freeman Hrabowski, for excellence in math and science, UMBC is also a charter member of the American College and University Presidents’ Climate Commitment. Musil’s Earth Week lecture at UMBC’s Albert O. Kuhn Library was sponsored by numerous university departments as well as the Colleges of Arts, Humanities and Social Sciences, the College of Natural and Mathematical Sciences, and the Honors College. In his lecture, Musil stressed Rachel Carson’s “sense of wonder” and her belief in the need to combine the arts, humanities, and the power of imagination and feeling with the sciences. With the opening of its new Lenehan performing arts center, Musil noted that Carson would have approved how UMBC and President Freeman Hrabowski were now taking the lead in combining the arts, humanities, and sciences in the interest of sustainability and social responsibility.